Our roll on roll off skip hire is the perfect partner for big site clearances. Get a quote from Aasvogel now. How do Aasvogel RORO Skips Measure Up? Our roll on roll off skips for hire come in 20 yard and 35 yard sizes. Our 20 yard roll on roll off skip can hold approximately 12 tonnes of waste. It’s ideal for soil, stone and other heavy waste. A 20 yard RORO from Aasvogel will measure in at around 20ft 5in (6.2m) long, 8ft (2.4m) wide and 5ft (1.5m) tall. Our 35 yard RORO is ideal for bulky material and heavy waste. The 35 yard roll on roll off skip measures in at approximately 20ft 5in (6.2m) long, 8ft (2.4m) and 8ft (2.4m) tall. The 35 yard RORO is fitted with a barn door, for easy walk in access. What is a Roll On Roll Off Skip? A roll on roll off skip (or RORO for short) is an extremely large waste container that can be rolled on and off a flatbed transport truck. Because they’re rolled into position and not lifted like a builders skip, roll on roll off skips can be made much larger and are able to carry large volumes of waste material safely in one go. 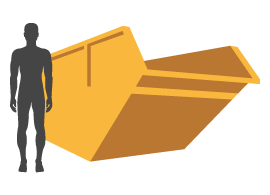 This makes roll on roll off skip hire a cost-effective and more environmentally friendly alternative to hiring multiple skips. Due to their enormous volume, roll on roll off skip hire is reserved for large-scale site clearances, where huge amounts of bulky construction or demolition waste needs to be removed. Do You Need to Hire a Roll On Roll Off Skip? Roll on roll off skips are commonly used on commercial or industrial demolition and construction projects, but any large-scale property development can benefit from a RORO container. They’re best suited to long-term projects, where high volumes of waste will be produced. 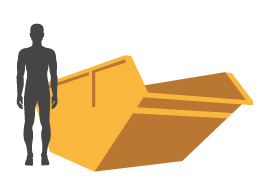 Because of their small footprint relative to their volume, roll on roll off skips can be stored on site for the duration of a project, without getting in the way. This makes site clearance logistics much easier to manage. Aasvogel has over 20 years of waste management experience, and in that time we’ve learned a lot about effective recycling, repurposing – and above all, excellent customer service. To make the skip hiring process as simple as possible, our friendly team handles all the admin on behalf of our customers, so you to get straight to work. Our first-class customer service is only a small part of what makes us proud to be Aasvogel. We’re committed to going above and beyond for the safety of our team, our customers and the environment. We take health and safety seriously, and we’re conscious of the impact we have on the environment around us – which is why we’re constantly striving to improve our recycling rate of 94%. We’re also competitively priced – so you’ll get all of our experience, diligence and waste-reducing potential at a very agreeable cost. Skip sizes offered by Aasvogel vary, and we’re keen to give you the best value. So to make your skip hire decision easier, our team of specialists is always available to offer help and advice. Just give us a call on 01235 760555 for an easy way to hire a skip.